For the football player, see Aleksei Rykov (footballer). Alexei Ivanovich Rykov[a] (25 February 1881 – 15 March 1938) was a Russian Bolshevik revolutionary and a Soviet politician most prominent as Premier of Russia and the Soviet Union from 1924 to 1929 and 1924 to 1930 respectively. Rykov joined the Russian Social Democratic Labour Party in 1898, and after it split into Bolshevik and Menshevik factions in 1903, he joined the Bolsheviks—led by Vladimir Lenin. He played an active part in the 1905 Russian Revolution. Months prior to the October Revolution of 1917, he became a member of the Petrograd and Moscow Soviets, and was elected to the Bolshevik Party Central Committee in July–August of the same year, during the Sixth Congress of the Bolshevik Party. Rykov, a moderate, often came into political conflict with Lenin and more radical Bolsheviks, but nonetheless proved influential when the October Revolution finally did overthrow the Russian Provisional Government, and as such served many roles in the new government, starting October–November (old style) as People's Commissar for Internal Affairs on the first roster of the Council of People's Commissars (Sovnarkom), which was chaired by Lenin. 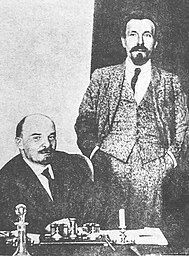 Alexei Rykov and Vladimir Lenin Oct 3, 1922. During the Russian Civil War (1918–20), Rykov oversaw the implementation of the "War Communism" economic policy, and helped oversee the distribution of food to the Red Army and Navy. After Lenin was incapacitated by his third stroke in March 1923 Rykov—along with Lev Kamenev—was elected by the Sovnarkom to serve as Deputy Chairman to Lenin. While both Rykov and Kamenev were Lenin's deputies, Kamenev was the acting Premier of the Soviet Union. Lenin died from a fourth stroke on 21 January 1924 and on 2 February Rykov was chosen by the Council of People's Commissars as Premier of both the Russian Soviet Federative Socialist Republic and of the Soviet Union, which he served as until 18 May 1929 and 19 December 1930, respectively. On 21 December 1930 he was removed from the Politburo. From 1931-37 Rykov served as People's Commissar of Communications on the Council he formerly chaired. On 17 February 1937—at a meeting of the Central Committee—he was arrested with Nikolai Bukharin. In March 1938 both were found guilty of treason and executed. Alexei Ivanovich Rykov was born on 25 February 1881 in Saratov, Russia. His parents were ethnic Russian peasants from the village of Kukarka (located in the province Vyatka). Alexei's father, Ivan Illych Rykov, a farmer whose work had led the family to settle in Saratov died in 1889 from cholera while working in Merv. His widowed stepmother could not care for him, so he was cared for by his older sister, Klavdiya Ivanovna Rykova, an officeworker for the Ryazanskaya-Ural railroad. In 1892 he began his first year of middle school in Saratov. An outstanding student, he started high school at age 13. He excelled in mathematics, physics and the natural sciences. At 15 Rykov stopped attending church and confession, and renounced his faith. He graduated from high school in 1900 and enrolled at the University of Kazan to study law, which he did not complete. Rykov joined the Russian Social Democratic Labour Party (RSDLP) in 1898 and supported its Bolshevik faction when the party split into Bolsheviks and Mensheviks at its Second Congress in 1903. He worked as a Bolshevik agent in Moscow and Saint Petersburg and played an active role in the Russian Revolution of 1905. He was elected a member of the Party's Central Committee at its 3rd Congress (boycotted by the Mensheviks) in London in 1905 and its 4th Congress in Copenhagen in 1906. He was elected candidate (non-voting) member of the Central Committee at the 5th Congress in London. Initially supportive of Bolshevik leader Vladimir Lenin in the 1908-09 struggle with Alexander Bogdanov for the leadership of the Bolshevik faction Rykov voted to expel the latter at the June 1909 mini-conference in Paris. He spent 1910-11 exiled in France, and in 1912 expressed reproach towards Lenin's proposal that the Bolsheviks become an independent party. The dispute was interrupted by Rykov's exile to Siberia for revolutionary activity. Rykov returned from Siberia after the February Revolution of 1917 and re-joined the Bolsheviks, although he remained skeptical of their more radical inclinations. He became a member of the Petrograd Soviet and the Moscow Soviet. At the 6th Congress of the Bolshevik Party in July–August 1917 he was elected to the Central Committee. During the October Revolution of 1917, he was a member of the Military Revolutionary Committee in Moscow. After the revolution, Rykov was appointed People's Commissar of Internal Affairs. On 29 October 1917 (Old Style), immediately after the Bolshevik seizure of power, the executive committee of the national railroad labor union, Vikzhel, threatened a national strike unless the Bolsheviks shared power with other socialist parties and dropped Lenin and Leon Trotsky from the government. Grigori Zinoviev, Lev Kamenev, and their allies in the Bolshevik Central Committee argued that the Bolsheviks had no choice but to start negotiations since a railroad strike would cripple their government's ability to fight the forces that were still loyal to the overthrown Provisional Government. 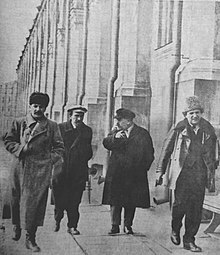 Although Zinoviev, Kamenev, and Rykov briefly had the support of a Central Committee majority and negotiations were started, a quick collapse of the anti-Bolshevik forces outside Petrograd allowed Lenin and Trotsky to convince the Central Committee to abandon the negotiating process. In response Rykov, Zinoviev, Kamenev, Vladimir Milyutin, and Victor Nogin resigned from the Central Committee and from the government on 17 November 1917 . On 3 April 1918 Rykov was appointed Chairman of the Supreme Council of National Economy and served in that capacity throughout the Russian Civil War. On 5 July 1919, he also became a member of the reorganized Revolutionary Military Council, where he remained until October 1919. From July 1919 and until August 1921, he was also a special representative of the Council of Labor and Defense for food supplies for the Red Army and Navy. Rykov was elected to the Communist Party Central Committee on 5 April 1920 after the 9th Party Congress and became a member of its Orgburo, where he remained until 23 May 1924. Once the Bolsheviks emerged victorious in the civil war, Rykov resigned his Supreme Council of National Economy post on 28 May 1921. On 26 May 1921, he was appointed Deputy Chairman of the Council of Labor and Defense of the Russian SFSR under Lenin. With Lenin increasingly sidelined by ill health, Rykov became his deputy at the Sovnarkom (Council of People's Commissars) on 29 December. Rykov joined the ruling Politburo on 3 April 1922, after the 11th Party Congress. A government reorganization in the wake of the formation of the Soviet Union in December 1922 resulted in Rykov's appointment as Chairman of the USSR Supreme Council of National Economy and Deputy Chairman of the USSR Council of People's Commissars on 6 July 1923. After Lenin's death on 21 January 1924 Rykov gave up his position as Chairman of the USSR Supreme Council of National Economy and became Chairman of the Council of People's Commissars of the USSR and, simultaneously, of the Sovnarkom of the RSFSR, on 2 February 1924. Along with Nikolai Bukharin and Mikhail Tomsky, Rykov led the moderate wing of the Communist Party in the 1920s, promoting a partial restoration of the market economy under NEP policies. The moderates supported Joseph Stalin, Grigory Zinoviev, and Lev Kamenev against Leon Trotsky and the Left Opposition in 1923–24. After Trotsky's defeat and Stalin's break with Zinoviev and Kamenev in 1925, Rykov, Bukharin and Tomsky supported Stalin against the United Opposition of Trotsky, Zinoviev and Kamenev in 1926–27. After Kamenev voiced opposition to Stalin at the 14th Party Congress in December 1925, he lost his position as Chairman of the Soviet Council of Labor and Defense—which he had assumed from Lenin following Lenin's death—and was replaced by Rykov on 19 January 1926. Under his leadership vodka was heavily taxed, and became known as "Rykovka". Some of his political opponents claimed that he was a heavy drinker, but in reality he was an abstainer. Rykov's Premiership encompassed drastic change in the power structure of the Soviet Union. From 1924 to 1930 the role of the Communist Party—informally led by Stalin who, as General Secretary, controlled Party membership—increasingly usurped powers from the legitimate governmental structures. Although an exact date cannot be given for Stalin's rise to power, the United Opposition—which consisted of Kamenev, Zinoviev, and Trotsky—was defeated and its followers were expelled from the Party by December 1927. After the defeat of the United Opposition, Stalin adopted more radical policies and came into conflict with the moderate wing of the party. The two factions maneuvered behind the scenes throughout 1928. In February–April 1929 the conflict came to a head and the moderates, branded the Right Opposition, or "Rightists", were defeated and forced to "admit their mistakes" in November 1929. Rykov lost his position as Premier of the Russian SFSR to Sergei Syrtsov on 18 May 1929, but retained his other two posts. On 19 December 1930, after admitting another round of "mistakes", he was replaced by Vyacheslav Molotov as both Soviet Premier and Chairman of the Council of Labor and Defense. Two days later, Rykov was expelled from the Politburo, taking with him any chance of political advancement. On 30 May 1931, Rykov was appointed People's Commissar of Posts and Telegraphs, a position that he continued to occupy after the Commissariat was reorganized as People's Commissariat for Communications of the USSR in January 1932. On 10 February 1934, he was demoted to a candidate (non-voting) member of the Party's Central Committee. On 26 September 1936, in the wake of accusations made at the first Moscow Show Trial of Kamenev and Zinoviev and Tomsky's suicide, Rykov lost his position as People's Commissar of Communications, but retained his membership in the Central Committee. Expecting the worst, Rykov nearly decided to follow the example of his close friend Mikhail Tomsky and preempt arrest by committing suicide, but was convinced otherwise by his family. As Stalin's Great Purge intensified in early 1937, Rykov and Bukharin were expelled from the Communist Party and arrested at the February–March 1937 meeting of the Central Committee on 27 February. On 13 March 1938, at the Trial of the Twenty-One, Rykov, Bukharin, Nikolai Krestinsky, Christian Rakovsky, Genrikh Yagoda, and sixteen other Soviet officials were found guilty of treason (having plotted with Trotsky against Stalin) and sentenced to death by the Soviet Military Board. Rykov wrote a letter to the Soviet Military board requesting clemency but was unsuccessful in convincing them to overturn the verdict. On 15 March, most of them were executed. Christian Rakovsky was executed in 1941. The Soviet government annulled the verdict in 1988, during perestroika. Wikimedia Commons has media related to Alexei Rykov. ^ "Kremlin Children". Archived from the original on 2011-10-04. Retrieved 2011-06-24. ^ a b c d e f g h i j k l m n o p q "Aleksey Ivanovich Rykov biography—Archontology". ^ Anthony Heywood. Modernising Lenin's Russia: Economic Reconstruction, Foreign Trade and the Railways, Cambridge University Press, 1999, ISBN 0-521-62178-X p. 180. ^ a b Rappaport, Helen (1999). "Aleksey Ivanovich Rykov". Joseph Stalin: A Biographical Companion. ABC-CLIO. p. 238. ISBN 9781576070840. ^ Rykov, Alexei. "Rykov's last plea". Library of Congress. Library of Congress. Retrieved 4 October 2016.